The idea of home automation has been around for years, with systems that let you control the level of lighting in your home, the temperature, what time the doors lock; systems that can open and close the curtains, turn appliances on and off and much more. 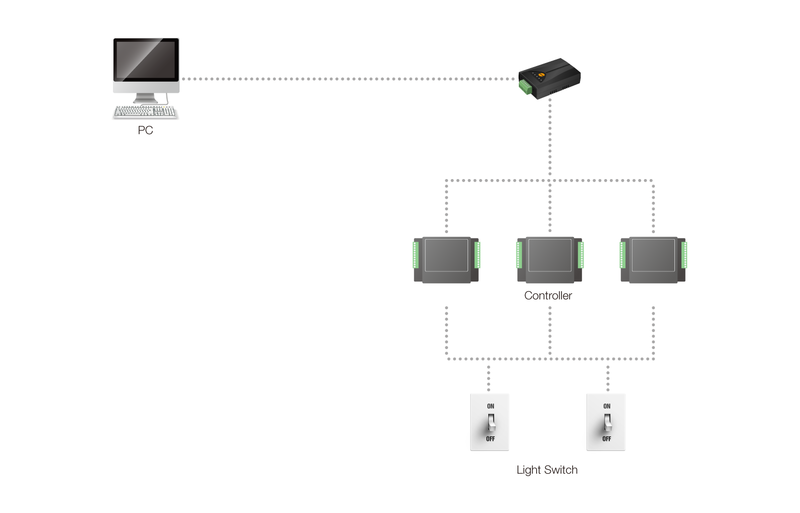 In this section, let’s take a look at how Sollae Systems’ products are applied in controlling remote lighting systems. Sollae Systems’ RS422/RS485 to Ethernet converter is useful to build economical lighting control system. Once embedded with a serial Ethernet converter, it quickly and easily adds network capabilities to a lighting controller. Since it helps the system overcome distance limitation originally due to RS422/RS485 communication, you can remotely control both indoor and outdoor lighting of residential, commercial and industrial areas without the distance problem. With Sollae Systems’ serial Ethernet converter, therefore, you can take advantages of maximizing intelligent management and energy savings by controlling individual or group of lighting in buildings, hotels and home simultaneously. Furthermore, Sollae Systems’ wireless solution additionally benefits you from reducing extra installation cost while improving flexibility.